Today’s teacher rally is evidence of the incredible passion North Carolina educators have for their profession and the need to do more to give them the support they need. While legislative leaders continue to tout plans that don’t meaningfully move the needle, Governor Cooper stands with North Carolina’s teachers and has released a plan to invest in our public schools and get teacher pay to the national average. This afternoon, Governor Cooper will address the March for Students and Rally for Respect at 3:30pm. Governor Cooper’s budget gives educators a meaningful raise averaging 8%, takes concrete steps to improve school safety, and lays out a plan to make North Carolina a Top Ten Educated State. Governor Cooper’s budget proves that we can do more for our teachers this year. Legislators should meet with educators and make meaningful progress on these priorities. Governor Cooper’s budget does more for our teachers, students and public schools. Supporting Our Educators with an Average 8% Pay Raise – Governor Cooper’s budget ensures all teachers receive at least a 5% raise this year, with the average being 8%. This includes veteran teachers, who legislative Republicans continue to leave out. This puts North Carolina on track to reach the national average in teacher pay by 2021. Principals would get an 8% increase in base pay. Tax Fairness for Teacher Pay Raises – The budget pays for these much-needed raises by freezing the Republicans’ additional income tax breaks for large corporations and people making more than $200,000 a year. Instead, it directs those funds directly back into teacher pay. Under the Republican tax changes, millionaires get a tax cut 85 times what a working family receives. Adds 2,000 pre-K slots and increases Smart Start funding by $15 million to ensure that children receive a strong foundation for learning. Provides educators a $150 stipend to cover out-of-pocket classroom supplies. Authorizes $75 million to begin to fix the class size chaos. Right now, North Carolina per pupil spending is 9% behind pre-recession levels. It also includes $2.5 million to bolster student support services at HBCUs, part of a $16 million plus overall investment in HBCUs. Expands the Teaching Fellows ProgramProvides more than $5 million for professional development for teachers. Provides $3 million to expand opportunities for academically gifted students from under-represented communities. 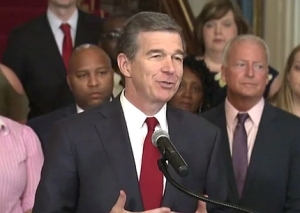 School Safety and Mental Health – Governor Cooper is committed to keeping students and schools safe and that means addressing both classroom security and youth mental health needs. The Governor’s budget includes $130 million to hire more support personnel like nurses and school resource officers and upgrade facilities to be more secure. Additionally, the Governor believes the legislature should put a $2 billion school construction bond on the ballot in 2018. Given that schools across the state estimate that at least $8 billion is needed to build new schools, the people of North Carolina deserve a vote.